Blue/black is one of my most used colour choices in inks. 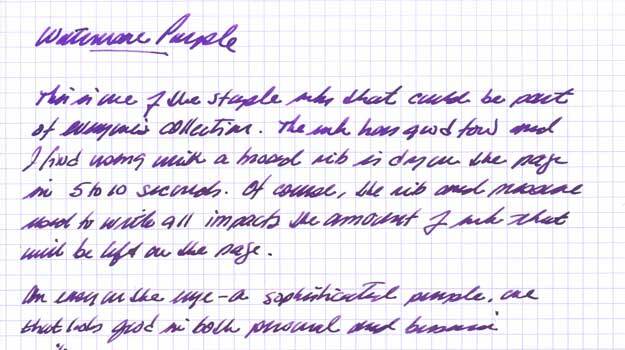 Purple is a standby and a colour I regularly seem to rotate through my pen collection. 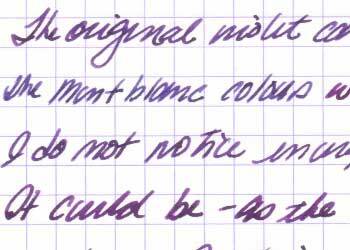 The Waterman Purple is one colour I have been using for years. I can go back and read my journal from some of my first trips in the 1980`s and the ink colour looks good and pages and pages of writing a easy on the eye. As you try various colours your will find some don`t look quite so good a few years later! 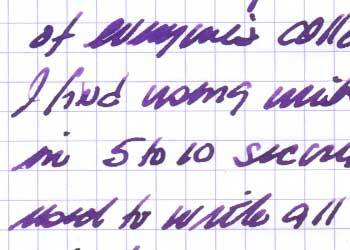 Good flow and the ink dries in 5 to 10 seconds, actual dry time depends in part on the width of the nib, the hardness of the paper and the pressure you write with. Private Reserver Burgundy Mist was a surprise, when I first heard about it the term "mist" led me to believe I would never use or try the ink. But I read an article in Stylophiles and sure enough, it is a beauty. Rich tone. 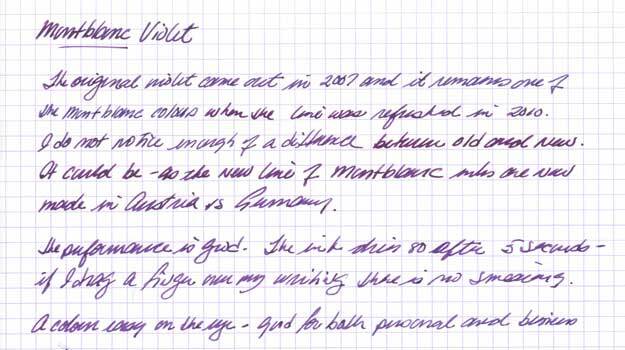 If you had blue ink in your pen be sure to really clean it out otherwise you will not get the subtle tones. I leave Burgundy Mist with my Inks of Choice, however, I am writing with some of the older production ink, when it came in round glass bottles. I have not purchased the ink in the past few years so the characteristics of the ink may have changed. This ink came out near the end of 2007 and from the first time I tried it I must say the colour, intensity and flow of the ink have been very good. It is very similar to Burgundy Mist by Private Reserve, but has a slightly crisper look. It is a dark enough colour that a full page of text is easy on the eye. I even get to use that great Montblanc ink bottle. The colour was also continued in 2010 when Montblanc updated their ink line and changed production from Germany to Austria. It is an "easy green" to take in that it is not overly bright, as some green are and stand off the page making a whole page of writing hard to read. No, this ink is dark enough that it looks good in business and personal notes. The ink dries in a reasonable time frame and has not of the "stickiness" that can be found in some brands.